Old mill stones at Collier Road and Redland Road in the Collier Hills neighborhood are mute reminders of a grist mill run by one of Atlanta's oldest homesteading families. 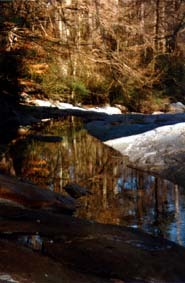 The stones sit high above Tanyard Creek, or branch, a winding, stoney stream that was the site of some of the fiercest fighting in Atlanta during the Civil War. 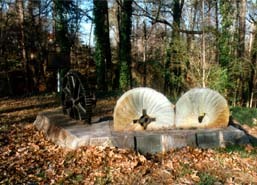 A marker reads: "150 feet downstream, on the right bank of Tanyard Branch, stood an antebellum grist mill built and operated by Andrew J[ackson] Collier, pioneer resident of this area (1827-1887). A notable landmark at the time of the Battle of Peachtree Creek - July 20, 1864, it . . . was the storm-center of the conflict that raged here, since the stream valley was a strategic approach to the Federal center toward which the Confederate forces . . . made their heaviest attacks." A Federal general who witnessed the bloodshed along Tanyard Creek, wrote, "Few battlefields of the war have been strewn so thickly with dead and wounded as they lay that evening around Collier's Mill." Across Collier Road is Tanyard Creek Park, where markers describe the Battle of Peachtree Creek, of which Tanyard Creek is a tributary, in greater detail. Benches and an overlook offer spots for reflection and access to the creek. Historic markers at the park give visitors a vivid picture of those events in 1864.